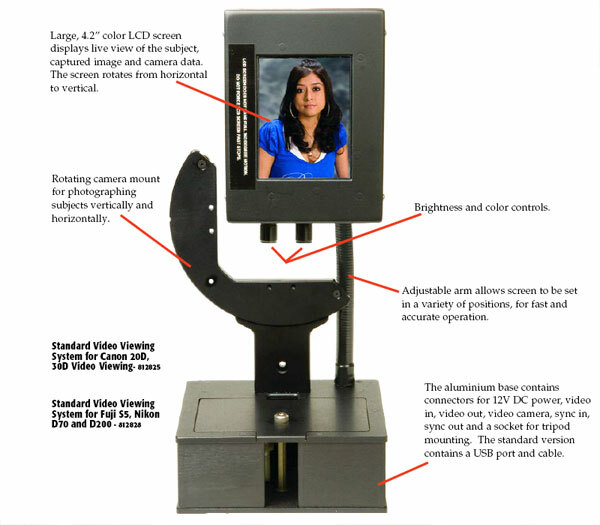 The Camerz Video Viewing System combines the ease of use of a high-volume portrait camera with the technology of today's digital SLR cameras. By adapting a high-resolution CCD camera to the viewfinder of the SLR, this system allows the subject to be viewed live on a large 4 inch color LCD screen. Captured images and other information normally displayed by the camera can also be viewed on the LCD. This rotating screen is mounted on an adjustable arm that can be set in a position that is convenient and comfortable for the photographer. Configurations are available for use with a variety of digital SLR's, including models made by Canon®. Fuji®, Olympus®, Nikon® and Kodak®. An optional USB port and Software allow the live and captured images to be viewed on a PC. The live image window can be open and viewed, even when an image and data management application or other programs are being used. 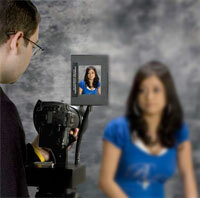 A rotating camera mount is included for photographing subjects horizontally and vertically. An optional Lindahl Lens Shade can also be adapted to protect the lens, prevent lens flare and accommodate the wide assortment of Lindahl filters and vignettes. Comfortably and quickly compose and capture images using a wide variety of digital SLR cameras, including models made by Canon®, Fuji®, and Nikon®. Review captured images on the LCD instantly. The system resets to live video after a preset time. Reduce fatique. No need to bend over and look through the viewfinder after each exposure. Now photographers can interact directly with the subject for consistently better expressions and poses. Camera and LCD can easily be changed from vertical to horizontal. Composite video output connector allows you to display on bigger screens. Display live and captured images on a PC while running other programs. Mounts on any standard professional tripod or camera support. PC to 1/4” Phono Sync Cord, 20’ 1/4” Phono to 1/4” Sync Cord and Instruction Manual. 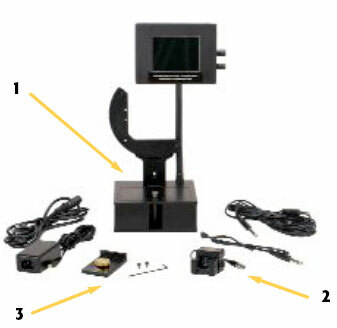 Video Camera Module includes: Video Camera with Digital Camera Viewfinder Mount and .050” allen wrench. Digital Camera Mount includes: Digital Camera Mount Bracket, 5/16” allen wrench and (2) fastening screws. mount, control box and a complete set of cords. USB cable and software for viewing on a PC. USB System is the same as the USB/Standard model, without the built-in 4" color LCD display.